[ALDUB MaiDen Moment Featured Image from Eat Bulaga Telecast.] 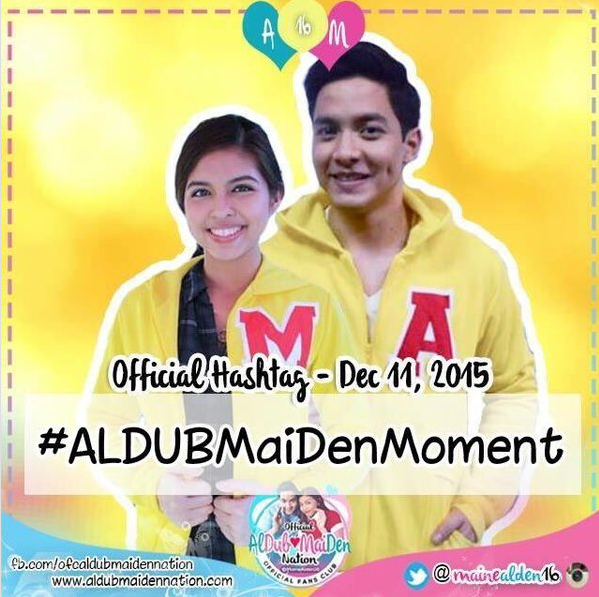 The ALDUB MaiDen Moment episode made some viewers feel like it’s a Saturday. The Eat Bulaga hosts checked out the events at the mansion. Today is the day that Alden visits the mansion again. He has a wish for YayaDUB that he directed through Lola Nidora. Lola Nidora then set Alden’s return to the mansion to visit YayaDUB again. Turns out that Donya Tinidora is just hungry. Hence, the hazy perceptions. “Alam mo. Nagugutom ako ha? Parang gusto kong kumain ng … Tutal nasa bahay naman tayo – tuyo at itlog na maalat.” (You know. I am hungry. I’d like to eat some … Since we’re at home – dried fish and salted egg.) Ryan liked the meals suggested at the mansion. Rihanna then assured the sisters that Donya Tinidora’s request is noted. For the meantime, the resident hosts went off with the Eat Bulaga programming prepared while waiting for the next events at the ALDUB MaiDen Moment episode. Sam YG then clarified what he just heard at the ALDUB MaiDen episode. “Kayong dalawa lang?” (Just the two of you?) Alden confirmed it. “Kami lang muna.” (Just us for now.) With this. Alden bid Broadway Centrum goodbye. And off to the waiting van to fetch YayaDUB home. While waiting for Alden to reach YayaDUB’s school, resident hosts Ryan Agoncillo and Pia Guanio then found Donya Tidora and Donya Tinidora outside Lola Nidora’s bedroom. Dora didn’t sound frustrated. But her words gave her away. “Lola, kaya nga po ako umuwi para maalagaan ko kayo. Marami nga po akong napapagaling. Sarili ko namang lola, ayaw makinig sa akin.” (Granny, that’s why I came home so that I could take care of you. I could hear several people. My own grandmother doesn’t want to listen to me.) Lola Nidora didn’t answer at Dora’s last quip. The sisters listening outside can’t tell if Lola Nidora is too tired to reason at the ALDUB MaiDen Moment episode. Donya Tinidora felt duped again. “Maghahanap ka pa ng masayang anaconda?” (You have to look for a happy anaconda?) Dora shared what makes an anaconda tear up in happiness. “Ang anaconda nagkakaroon lang siya ng tears of joy kapag nai-in love siya sa butiki.” (An anaconda emits tears of joy whenever it falls in love with a lizard.) Donya Tinidora felt frustrated too at the ALDUB MaiDen Moment episode. “Bakit naman ang tigas-tigas ng ulo ng matanda na yan?” (Why is that old hag so stubborn?) Donya Tidora and Donya Tinidora accompanied Dora downstairs first while waiting for Lola Nidora to come out of her room. Donya Tidora slightly blamed Lola Nidora’s pain on her sister’s stubbornness. “Ikaw naman kasi, ate. Ayaw mo makinig kay Dora. Dalubhasa yun.” (The problem with you, elder sister. You won’t listen to Dora.) The KalyeSerye commentators then reminded the grannies. “Ang BP. Ang BP.” (Careful with the BP [blood pressure].) The mood swings are swift. The meds may have conflicted with Lola Nidora’s consciousness at the ALDUB MaiDen Moment episode. The stronger emotion prevailed. And Lola Nidora broke down in tears. Donya Tinidora had to ask Lola Nidora calmly to avoid another breakdown. “Ano nga ba yang sinasabi mo?” (What were you trying to tell us?) Lola Nidora can’t still bring herself to tell her sisters. “Ttxt ko na lang.” (I’d just text you.) The sisters were having a moment when an SUV horn honked outside. The KalyeSerye commentators had trouble viewing the SUV from a different camera as it looked foggy. Lola Nidora snapped back in the moment. She remembered that they have a visitor. She then told her sisters to meet them.”May dumadating na bisita.” (Some visitors is coming over.) Donya Tidora speculated if it’s the expected visitor at the ALDUB Maiden Moment episode. “Papaano nating nakita?” (How did we see them?) Lola Nidora repeated what she said. “Salubungin natin ang mga bisita. Salubungin ng sibat.” (Let’s meet the visitors with a spear.) Donya Tidora realized that they have CCTV. Donya Tinidora realized how bad Lola Nidora’s condition is at the mention of a spear. The van has Alden and YayaDUB. YayaDUB called out to her grannies from the door. She also stopped Alden from removing his shoes at the doorstep. No need just like in the ALDUB EB For Love episode where Donya Tidora and Donya Tinidora told him to wear his shoes again. The grannies were happy to see Alden again in the De Explorer Mansion. Alden and YayaDUB then paid their respects to the grannies before Alden revealed his gift at the ALDUB MaiDen Moments episode. Alden returned carrying bouquets of flowers and a basket of fruits at the ALDUB MaiDen Moments episode. He somewhat slipped by the living room floor. Donya Tinidora found it funny. “Pogi ito. Pero ano lang … Lampa. Alam mo, pogi ka sana. Lampa ka lang” (Such a handsome guy. Just a little … Clumsy. You know you’re handsome. But you’re clumsy.) YayaDUB chided Alden. “Ano ba yan, Alden? Lagi na lang.” (What gives, Alden? As always.) Lola Nidora tried to understand Alden though. “First time mag-skinny jeans.” (It’s his first time to wear skinny jeans.) Donya Tinidora thought that Alden got used to the hovertrack a little too much. Alden then asked how is Lola Nidora as of the ALDUB MaiDen Moments episode. “Eto. Medyo malakas lakas. Pinainom ako ni Dora. Mainam yung gamot ni Dora.” (Here. A little stronger. Dora had me take some med. Dora’s meds are effective.) Alden then asked for Dora. “Nandyan po ba si Dora?” (Is Dora there?) Lola Nidora then mentioned that her grand-daughter is asleep. Donya Tinidora doesn’t understand the need for YayaDUB to study. “Hija. Bakit ka pa nagaaral? Ba’t di ka pa mag-asawa?” (Dear. Why do you have to study? Why don’t you get married?) Lola Nidora is fed up with Donya Tinidora pushing YayaDUB to get married. She ended up scolding her at the ALDUB MaiDen Moments episode. “Ayan ka na naman. Marami pang pangarap ang mga ito. Wag mong ginugulo ang utak nila. Hayaan mo silang enjoy pagkakaibigan nila.” (There you go again. They still have dreams to fulfill. Don’t rattle their minds. Let them enjoy their friendship.) The grannies left them for awhile to prepare the dining table. YayaDUB was taken aback in a happy way at the ALDUB MaiDen Moments episode. “Hindi mo na kailangang ipamukha sa akin. Grabe ka.”Donya Tidora called out from the kitchen. “FUNNY ka na naman ha?” (You let your legs be pulled into his words again.) Alden then plucked a flower at the garden for YayaDUB. YayaDUB felt spoiled. “May pabulaklak ka na nga kanina eh.” (You already gave flowers awhile ago.) It resulted in a DUBsmash exchange with recent additions to the playlist. It gave YayaDUB determination to succeed. A thought she shared with Alden at the ALDUB MaiDen Moment episode. “Kaya gusto ko nang matapos kurso ko para pag nagtrabaho ako, makakatulong na ako sa kanila.” (That’s why I want to finish my course so that once I get to work, I can help them.) Alden then got a little distracted with the ants he found on YayaDUB’s face. YayaDUB traced the ants from the flower that Alden placed on her ear. Alden then reminded Lola Nidora of the second wish. “Di po ba 2:10 na? San na po yung wish ko, Lola?” (Isn’t it already 2:10pm? Where is my wish, granny?) Lola Nidora reiterated that it can wait for later. Lola Nidora finished her food. Donya Tinidora is supposed to talk in this part of the ALDUB MaiDen Moment episode. But her mouth is full. When she tried to talk, she almost choked. Donya Tidora was just beside her to rub her back. Lola Nidora had an epiphany at the ALDUB MaiDen Moment episode. “Alam mo kayong dalawa. Nakakatawa kayong magkita. Pagkatapos kumain nagpa-FANTASTIC BABY. Parang walang problema.” (The two of you. You’re funny every time you meet. After eating you go into FANTASTIC BABY mode. As if you don’t have problems.) YayaDUB then reminded her of the best lesson Lola Nidora shared. “Lola, sabi nyo, tawanan ang problema.” (Granny, you told us to laugh at our problems.) Everyone then laughed. Lola Nidora can’t find herself laughing. She can’t even force one. Lola Nidora continued. “Alden, salamat sa pagkalinga kay Yaya. Tidora, Tinidora, mahal na mahal ko kayo. Rogelio Rogelio Rogelio, ipasok na.” (Alden, thank you for nurturing our nanny. Tidora, Tinidora, I love you very much. Rogelio Rogelio Rogelio, bring them [big boxes] in.) Donya Tidora and Donya Tinidora were elated at the big boxes. Assuming that they are big gifts. Donya Tidora has imagined all the items that she can fit in them as of the ALDUB MaiDen Moment episode. Donya Tinidora was more than thankful. “Nagpa-last supper ka na. Anlalaki pa ng mga regalo mo.” (You have last supper moment. Then you have big gifts.) Lola Nidora tried to snap her sisters out of it. “Wow, hindi pa Pasko ano? Hindi regalo yun. Anong petsa ba?” (It’s not yet Christmas. And these are not gifts. What date is it again?) YayaDUB asked before Donya Tidora and Donya Tinidora could regain their composure at the ALDUB MaiDen Moment episode. “Lola, para saan po ba yan?” (Granny, what are those boxes for?) Donya Tinidora and Donya Tidora has to prod Lola Nidora further about what’s really going on. 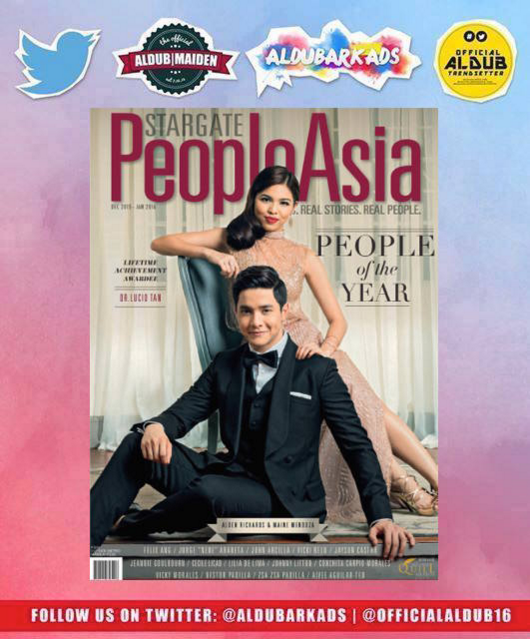 YayaDUB answered for Alden. “Tutulong lang po, Lola.” (He will just help us, granny.) Lola Nidora understood Alden’s effort. So she asked him to assist him. “Alalayan mo ako.” (Assist me.) She snapped at Donya Tinidora. “Tinidora, wag yung mga paso ang unahin mo. ‘Yung mga damit nyo. ‘Yung mga importanteng gamit nyo.” (Tinidora, don’t pick up the plant pots first. Go first with your clothes and your important items.) Alden helped Lola Nidora from the dining table to the living room. She looked exhausted upon breaking the bad news at the ALDUB MaiDen Moments episode. Donya Tinidora remembered the more important items. “Naku! Yung papeles ko. Yung card ko, magaaral ako next sem.” (Oh no! My papers. My card, I will study next semester.) Alden helped Lola Nidora sit before helping everyone pack. Lola Nidora then saw the portrait that Alden carried. “Iwan mo na yan, Alden. Walang bibili niyan.” (Leave that, Alden. Nobody would buy that [at the auction].) One of the Rogelios approached Lola Nidora to inform her of the sheriff’s arrival. Lola Nidora sprung back to her feet as the truck horn honked off. End of the ALDUB MaiDen Moment episode. Any remedies left for the House of De Explorer? How can Alden be of help? Tune in to Eat Bulaga. Monday to Saturday at noontime. Like Eat Bulaga’s official Facebook page to catch the ALDUB MaiDen Moment episode replay. The Fall of the House of De Explorer. A fitting alternative episode title to the ALDUB MaiDen Moment episode. Was this the event that Donya Tinidora inadvertently predicted at the EB Dabarkads Pa More episode when she blurted “Ikaw ang maghahango sa amin sa kahirapan”? (You will pull us out of poverty.) Episode recaps would help us find the answers. Just don’t forget to like us on Facebook and follow us on Twitter. We’d be expecting you.